Reduce Reuse Recycle is known to the environmentally conscious consumers by the term of 3Rs. In the 3Rs term the first R stands for Reduce and the idea behind it, is that we should buy goods only when we need them and avoid buying unnecessary ones. The second R stands for Reuse and the idea behind it, is that we should use the products we buy as much we can before throwing them away. The last R stands for Recycle and the idea behind it, is that we should encourage the idea of recycling products by putting what is left in the proper recycling stream bin to be recycled. The most important way for reducing waste is not creating waste at the first place. In order to manufacture products from raw materials we need ample amount of energy and raw materials which are not infinite. Mostly the raw materials used for manufacturing new products are extracted from the natural resources, then the product undergoes fabrication process and later it is sold in the market. By reducing the usage of unwanted products and reusing the needed products ample time will save our natural resources ,energy ,save production cost and safeguard our environment from pollution. We can buy a product with less packing material. Some manufacturers will pack their product with less packaging material hence they are decreasing the raw materials which is used for packing the product and hence the cost of the product and the waste produced by the packing material can be decreased. We should prefer buying reusable products than disposable items. For example we can buy silverware cup items than buying disposable ones. By maintaining the products in a proper way ensures the products long life. Instead of throwing the products when they are worn out we can repair then and reuse them again if possible .Think twice before replacing any product. Share the items which you use rarely with our neighbors and relatives. Items such as tools, party items can be shared with others which in turn save our money. Donate the unwanted appliances, books, electronic products to non-profitable organization and charity. Someone’s trash can become some other one’s treasure. Energy used for manufacturing new products is reduced by reducing the usage of unwanted products which in turn saves our natural resources. In manufacturing process there will be emission of some greenhouse gases which are reduced by decreasing the product usage. By reusing the product several times, the thrash which accumulate on the landfills can be reduced. Reducing and reusing the products will encourage the consumers to use the product to full extent. 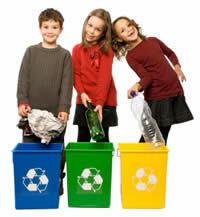 The process of gathering the trash products, processing them and making them back into new products is called recycling. The process of recycling will benefit our environment a lot. Products which can be recycled are glass bottles, aluminum cans, paper etc… These materials can be collected by several methods such as conducting refund programs by using volunteers who would be involved in collecting the waste materials and sending them to factory where recycle products are manufactured. Collected materials are cleaned, separated and processed in specific manner before they are sent to the recycling factory. Products which are recycled will become new products, possibly as those of the waste materials which are recycled. For example the new product which is obtained after recycling waste glass bottle is another glass bottle. Sometimes new products obtained after recycling will be differ from product involved in recycling process. For example in recycling tires we get raw materials which are used to lay roads. Recycling process consumes less energy compared to the production of new products. For example amount of energy saved by recycling single glass bottle is the energy required to light the bulb for about six hours. Raw materials used in the original manufacturing process can be reduced to about 50 % by using cullet. Cullet is the crush material obtained from the waste products. Amount of greenhouse gas released during recycling process is less compared to the new product manufacturing process. Waste settle down on the landfills will be much less. Manufacturing cost of recycled product is less compared to new products and recycled product quality and purity is equal to the new product. The 3Rs concept is a concept which should become a way of living for all us. We should promote the 3Rs, Reduce Reuse Recycle, in every aspect of our social and community life. 3Rs should be introduced in education, community and government programs.